If one of your parents - or grandparents - does budo you can take one of about four possible deliberate approaches. But what if you don't even know? My first experience with fighting arts (well if I don't count soccer or rugby - probably I should) was some boxing when I was a teenager. I also played chess - boxing just seemed to me to be like playing chess using your body (chessboxing when it appeared a few years ago was an unlikely but obvious development in sport for me!). I remember a match against a boy who had no time for an intellectual approach. He immediately hit me hard on the chin. A few years later he went to prison for doing the same thing to a police officer. Anyway many years later to my surprise I found out that one of my uncles had boxed professionally. I was interested in Japan and Japanese culture and I went to Japan when I was in my twenties. I studied and practiced aikido and some other martial arts seriously and hard with the best teachers in the world. Now nearly thirty years later I teach aikido and aikibudo and self-defence. When I was in England in August 2010 I spent some time with an uncle I hadn't seen for many years. I knew he had done a little judo as an adult but I had the impression he had started judo some time after I had started martial arts myself. We talked about budo a little. He was particularly interested in the philosophical aspects of budo. In the middle of our interesting conversation my uncle casually mentioned learning a couple of judo techniques when he was a boy. A few times they were useful and as a result he was never bullied. Then to my incredulity my uncle told me that my grandfather had taught them to him and that my grandfather had studied jujutsu. Neither my grandfather nor my parents had ever spoken of it to me. So I was getting kakutougi (fighting arts) DNA from both sides of my family, boxing from one side and Japanese budo from the other. And I had been completely unaware of both of them . So was my decision to go to Japan and were all my years of hard budo training already all hard-wired into me from birth?! Did I perhaps not have any choice?! Wow! The DNA double helix. My own little iemoto I didn't even know about. One final question. 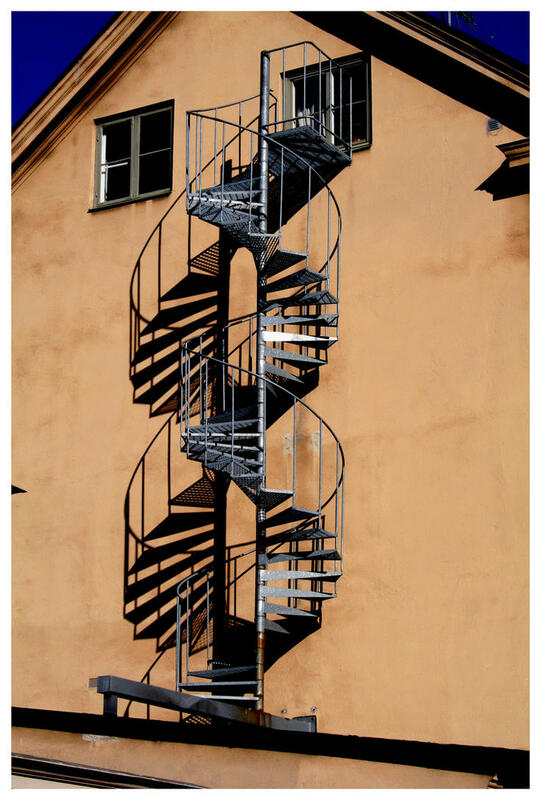 In David Van Elslande's great photo is the double helix DNA staircase going up or going down? 12 Responses to "Budo/DNA double helix"
Yes I know both sports, I have seen both in TV, but waterpolo directly. Of course your father did budo too, you have it in your DNA. I mentioned my uncle but maybe I should really include my father too. He was a very strong handball player - that's like squash using your fist - and he also played waterpolo. That's like a very tough martial art in a swimming pool! The stairs go which ever way you desire. The DNA question could be the old question of nature vs nuture. To me, it is going up, based on the perspective of the photograph focusing the attention to the roof line and showing that little bit of blue sky, as if you are viewing all that while climbing. If it were going down, I'd imagine the focus would be either the top of the roof itself bearing downward, or for the photographer to show a view of the ground from an aerial perspective. Does that make me an optimist?